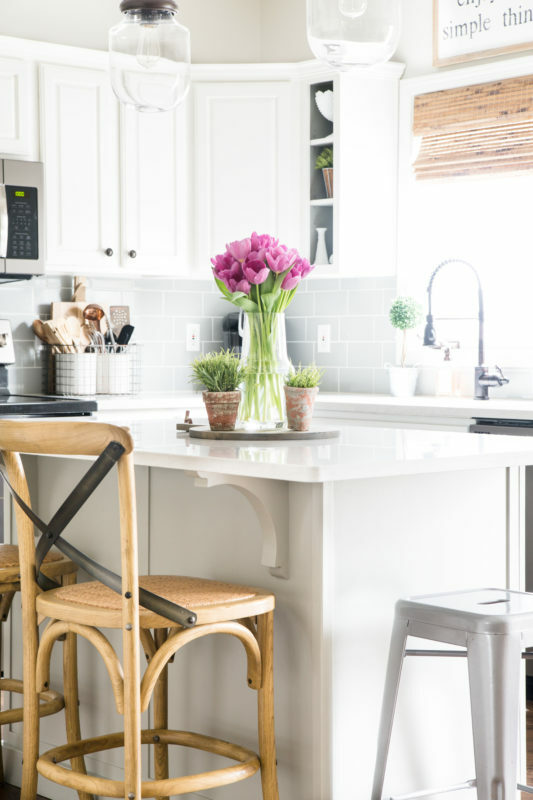 Do you decorate your kitchen for spring? 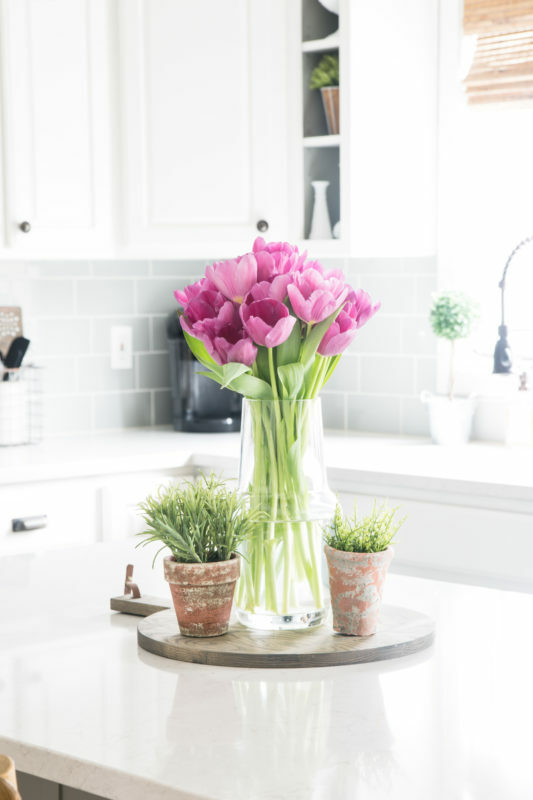 To me, a simple vase of tulips (and a little spring de-cluttering) is really all you need to make the kitchen feel fresh and happy for the new season. With the official first day of spring already over, it’s time to check out spring in the kitchen here at my house! I’m joining several fabulous bloggers today as we share some of our favorite spaces for spring. 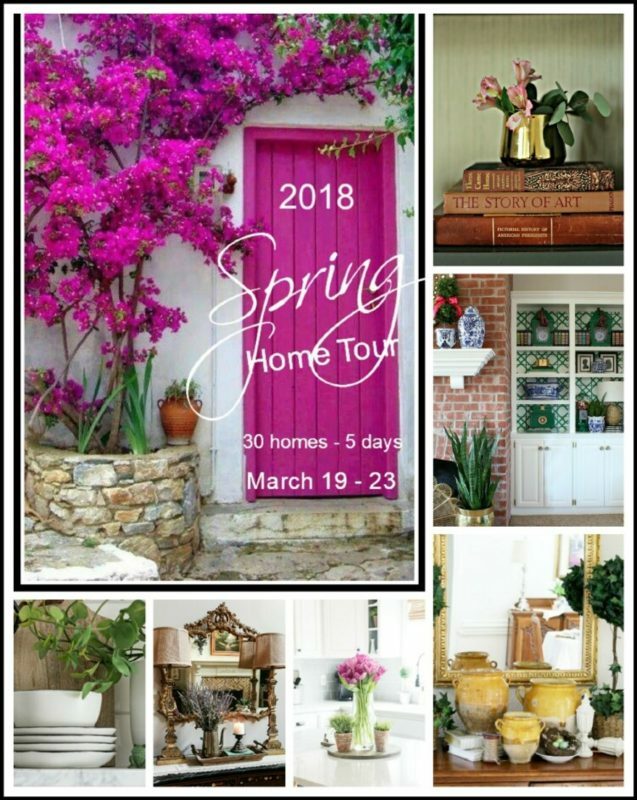 The lovely Marty from A Stroll Thru Life is hosting the Spring Home Tour, and I’m just honored to join. If you’re joining me Remodelando La Casa , welcome! I’m so glad you stopped by today! 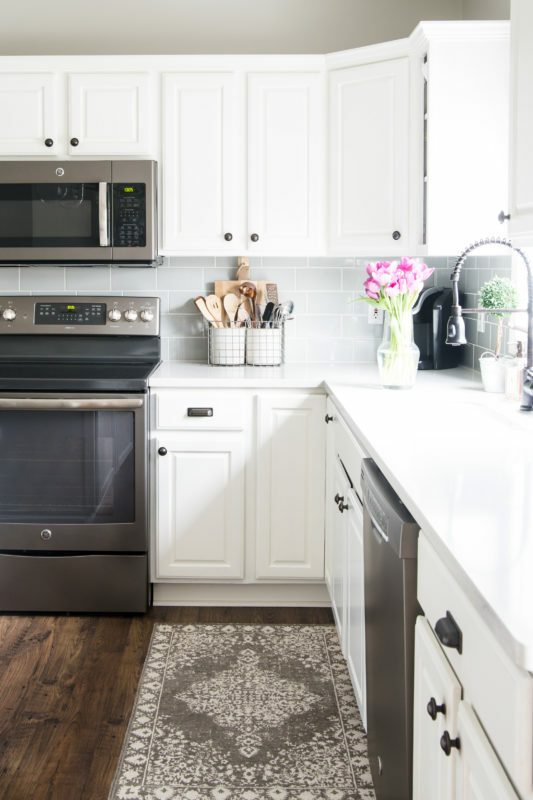 When I was contemplating how to give my kitchen a fresh, clean look for spring, it occurred to me that I should just keep it simple. These gorgeous purple tulips in a simple glass vase were really all the spring touches I needed. As soon as these tulips wilted I went back to the grocery store to see if I could find some that were exactly the same. I love fresh tulips in the spring, and this purple hue might be my favorite color tulip I’ve ever seen. The bright pop of purple looks so pretty against the grays and whites of my kitchen. I really kept everything else the same. 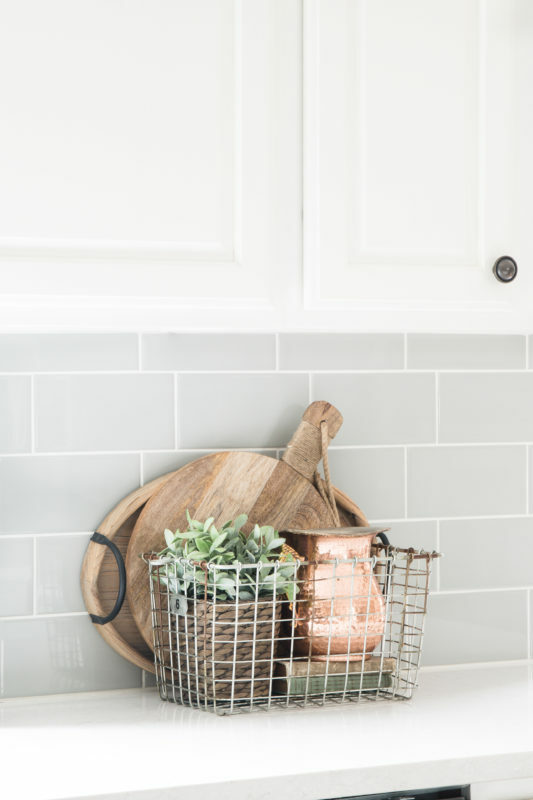 I try to balance out the cool tones of my kitchen cabinets, counter tops, and back splash with accessories that have warmer wood and copper tones. Every morning before I load up my daughter in the car for school, I try to make sure that the kitchen is cleaned up. (This does NOT always happen…ha!) I just love coming home to a quiet, clean kitchen. It motivates me to focus and get working right away. I love your kitchen and I love those tulips too. They really are all your pretty kitchen needs for Spring. Thanks so much for joining the tours, it’s always fun to see your home. Clean, bright and beautiful for spring. Love it April! What a dream kitchen! I adore the floors. It all looks so crisp and fresh for the spring. Yes, I do believe flowers are the best way to decorate a kitchen. And those purple blooms complement your kitchen so well. Beautiful! april, i am the same way about the kitchen except I don’t go to sleep unless it’s clean. cant stand waking up to a messy kitchen. your kitchen is so pretty and bright. happy spring. It looks so bright and welcoming, April! I feel you–kitchen redos are SO MUCH WORK, but they are so very, very worth it. Happy Spring! You have such a beautiful kitchen, April! Love all your Spring touches! What a lovely spring kitchen!!! April, I just love your kitchen, so very bright and charming:) Where did you get that rug? I’m in the middle of redoing my kitchen and the rug is exactly what I’ve been looking for. 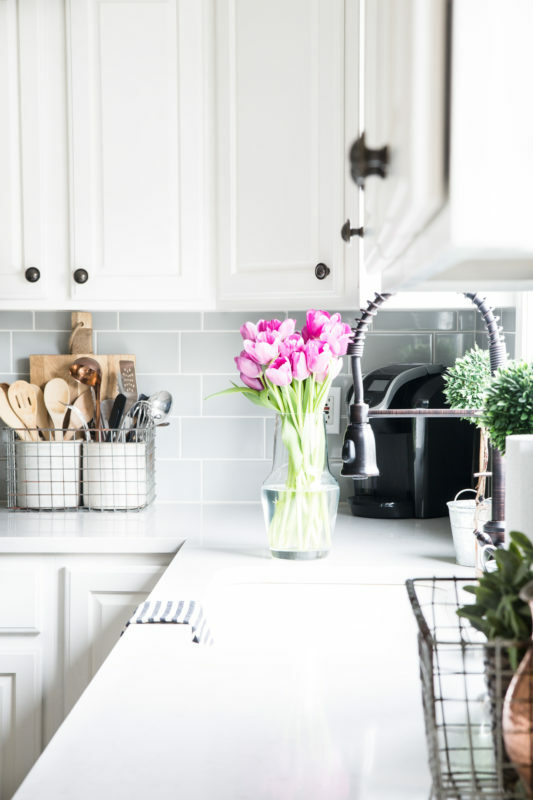 April, your kitchen is so gorgeous and those flowers add the perfect punch of color! I love the natural elements you’ve used and the simple styling, April! Beautiful Spring kitchen! Your kitchen is so beautiful April! I love how you styled it using those wire baskets (both utilitarian and pretty), and the flowers! 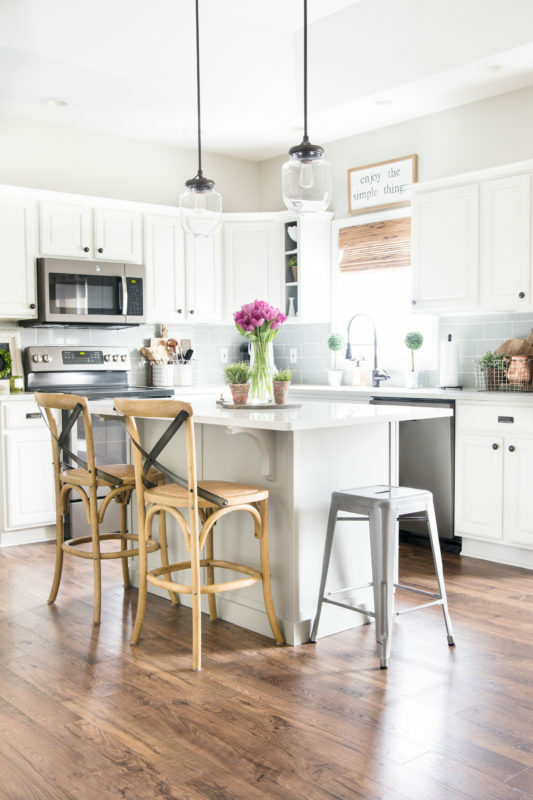 I definitely decorate my kitchen for spring too and all seasons since it is where we spend most of out time in!~ As always so honored to share this home tour with you dear! Cheers! Hi there, what colour / brand are your kitchen back splash tiles? i would love these in my kitchen.